Priya is now recovering in hospital in Glasgow. Transfer arrangements between two north-east hospitals set up because of a staff shortage have been condemned after it emerged a mum had to transport her seriously ill child 65 miles herself – only to be told she might not be admitted. 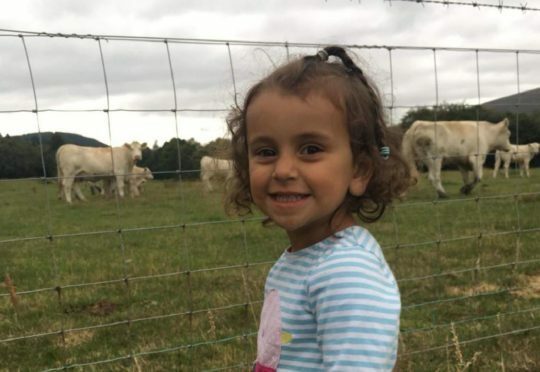 Lynne Mandal took her three-year-old daughter to Dr Gray’s Hospital in Elgin after seeing her health deteriorate following initial trips to the GPs. Following an assessment, doctors in Moray decided that the youngster needed to be admitted to hospital in Aberdeen. The children’s ward at Dr Gray’s is currently closed overnight and at weekends due to a staff shortage in the paediatrics department. However, when the family arrived in Aberdeen staff had not been informed they had been referred and were due to arrive. After two days at RACH, Priya was transferred to Glasgow for specialist treatment after being diagnosed with E-coli before contracting a potentially deadly syndrome that can cause kidneys to fail. Ms Madal, who lives in Elgin, said: “When the doctor said ‘So we will admit her to hospital’ it didn’t even clock to start with that we now had to drive an hour and a half to Aberdeen ourselves. She added: “The nurse who was doing our check on arrival said we will give you a name band but it’s not 100% that she’ll be admitted. Yesterday, NHS Grampian stressed that Priya’s condition was so severe that she would likely have had to be transferred to the Royal Aberdeen’s Children Hospital (RACH) regardless of the current staff shortage in Elgin. Ms Mandal has praised staff in Elgin and Aberdeen for the care given to her daughter – stressing the blame lies with the management arrangements. Priya remains in specialist care in Glasgow after two weeks but is now making progress towards a recovery. Yesterday, campaign group Keep Mum stressed more streamlined arrangements to be put in place for transfers between Moray and Aberdeen. A spokeswoman said: “One of our main concerns regarding the service is the failure of NHS Grampian to address welfare concerns. Yesterday, NHS Grampian encouraged Ms Mandal to discuss her experiences with them. A spokeswoman said: “Given the severity of her daughter’s condition it’s highly probably she would have been transferred to Aberdeen, irrelevant of the service change at Dr Gray’s.